But how is he going to sell lipstick? Benjamin Karsch is no stranger to larger-than-life CMO jobs. Procter & Gamble, Kraft, Johnson & Johnson, Cigna—Karsch has run the marketing for all of them. But Karsch (whom everyone calls Benjy) has quite a task ahead of him at Revlon, which hired him as CMO in February. Revlon is a $2 billion beauty empire whose products are for sale in over 100 countries. It's also an 83-year-old brand doing business in a segment packed with competitors. Net sales for 2014 were essentially flat. In a bid to reinvigorate things, CEO Lorenzo Delpani unveiled a new initiative in November—"Love Is On"—and now it's up to Karsch to build all his marketing around it. We caught up with Karsch at his New York office. Your CEO has said that "the new mission of our brand is to inspire love." I guess it's up to you to figure out what that means? Yes. "Love Is On" is much more than a tagline; it's a movement. And while we have started that movement with some initial advertising, there's a long journey we're going to go on. It's about inspiring passion and inspiring love for our customers. It starts with an emotional connection, but it ends up being part of the communication and the types of products we create. That can create different and deeper relations with our customers. But how does wearing Revlon makeup equate to love? If you think about what the cosmetics category is all about, it's all about how a woman feels when she's putting on her makeup. And we want her to feel love. We want her to feel the feeling of falling in love. You've often said that marketers need to use both left-brain and right-brain thinking. Can you explain what you mean? Successful marketing is not just about bringing creativity to ideas, which are typical to work you'd apply to create, such as coming up with ads. It's about bringing structured, analytical thinking to the creative work and using quantifiable analytics to identify which emotional ideas resonate the best. Company founder Charles Revson once said, "In our factory, we make lipstick. In our advertising, we sell hope." Does that reasoning still apply in 2015? The reasoning applies, but we've progressed. It's less about hope and more about beauty and self-actualization. And it's about how the consumer feels when she's wearing the makeup. And if she feels beautiful, then she is beautiful. Revlon makes, distributes and markets a slew of brands in multiple categories all over the world—and all the marketing is on you. Does the scale of your new job make you nervous? I wouldn't say there's anything making me nervous. The biggest opportunity is deeper engagement with our customers. We're creating a movement behind "Love Is On." Lorenzo kicked off the movement just as I was joining, which makes it a really exciting time. That movement is clearly not going to be a one-day conversation that our customers are having with us and with each other. It requires investment and more focus on digital. Revlon partnered with Google to create a customizable, shareable GIF for Valentine's Day. You mean stuff like that? That's a perfect example, but it's the tip of the iceberg. Revlon makes some items for men, but it's primarily a women's cosmetics brand. Is it difficult being the CMO of a company whose products you can't use yourself? Revlon's been a part of my life for as long as I can remember. My grandparents were Revlon distributors and had a beauty store. 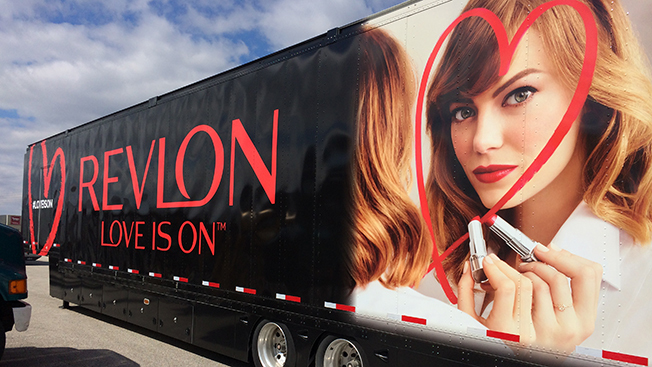 Revlon has this larger-than-life image, especially for me personally. And I am trying the products myself. I'm having them put it on, and it's definitely an eye-opening experience. How did you get the nickname Benjy? You and I are the same age, and when I was a kid, Benji was a TV show about a mischievous dog. My mother called me Benjy as a baby. And when I got to college, I tried to convert to Ben. But I ran for student government and I found that everybody remembered the name Benjy and I couldn't get rid of it. It stuck.